Jacques Reymond… over overindulgence… | 15,000kms of Food! Decided that winter in Melbourne is too dreary and that I needed some “highlights” to get me through. 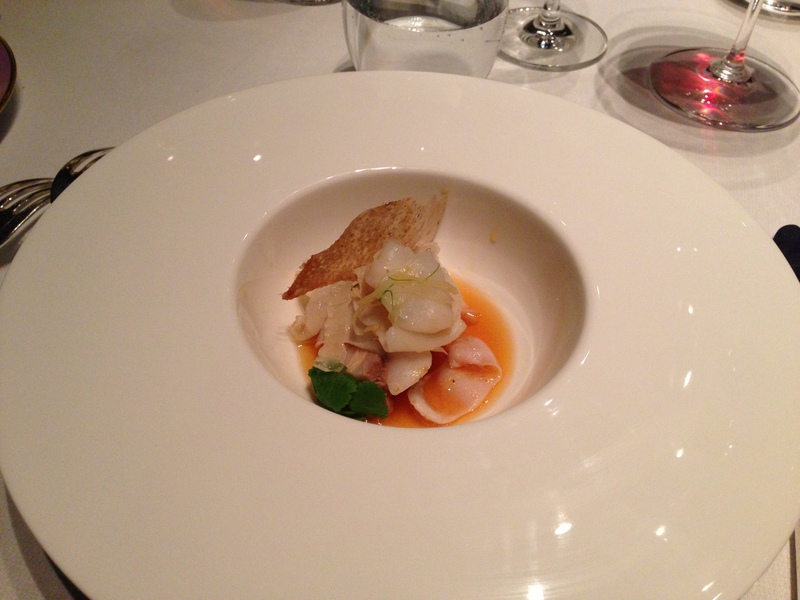 Hence, we decided to have an extra special date night at Jacques Reymond. Last time I was at Jacques it was about 4-5 years ago, and I remember the first time as being excellent. This time round, perhaps I am a different type of diner now, the wow factor wasn’t quite there. 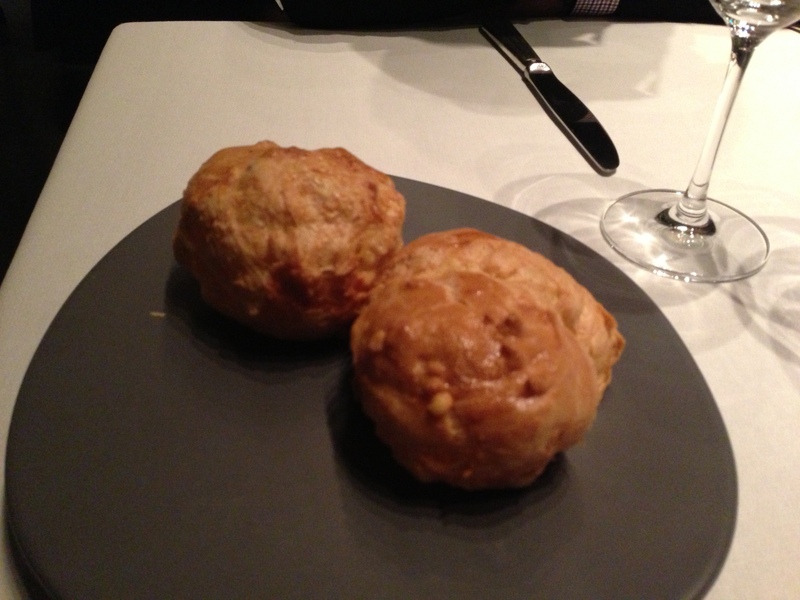 Degustation started with a appetizer of cheesy puffs (there’s probably a more fancy name, but whatever!). Had a lot of these during the last holiday in France, so knew what to expect – soft fluffy shoe pastry filled with cheese! They were delightful. 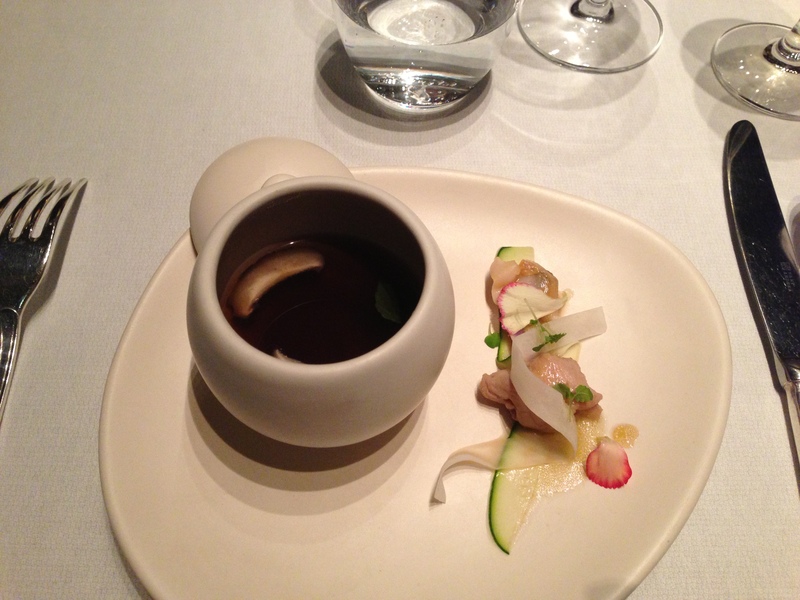 The “clear broth of shiitake, fragrant lemon balm, clams” was a beautiful subtle dish, with the broth being very flavourful with perfectly cooked clams. The “yellow fin tuna, smoked salmon mousse, spiced nougatine, togarashi, lemon caviar” another subtle dish. 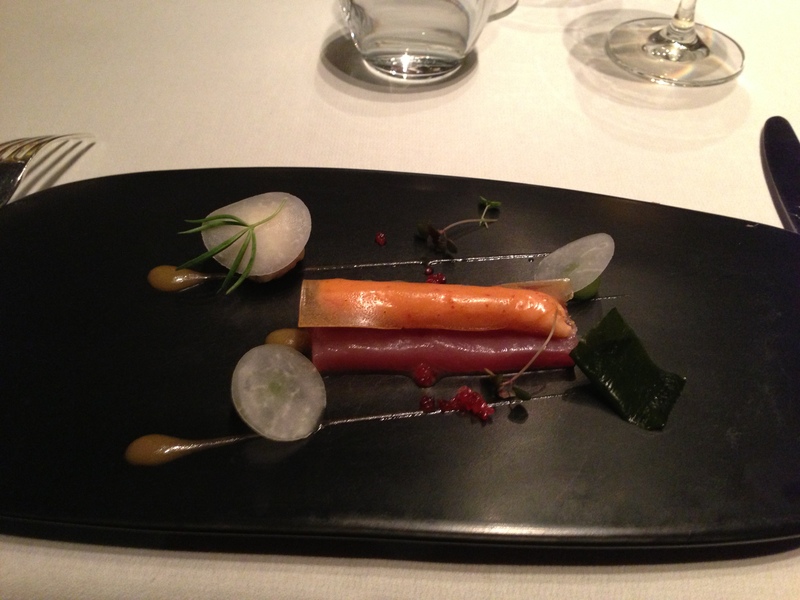 Interesting textures with raw fish, mouse and a jelly like sheath on top. Nothing makes me happier than perfectly cooked fresh fish, and the “King George whiting, acidities of pickles Japanese style, yuzu” dish delivered on that. The pickles elevated the fish to a whole new level. Gotta say, I love dishes that combine seafood and poultry. “Cuttlefish, pork and crispy chicken skin” was an excellent dish which was so tasty, I was scraping the bottom of the plate to get all the sauce. Finely sliced cuttlefish and pork with a super tasty broth/sauce topped with a think piece of crispy chicken skin – yum! 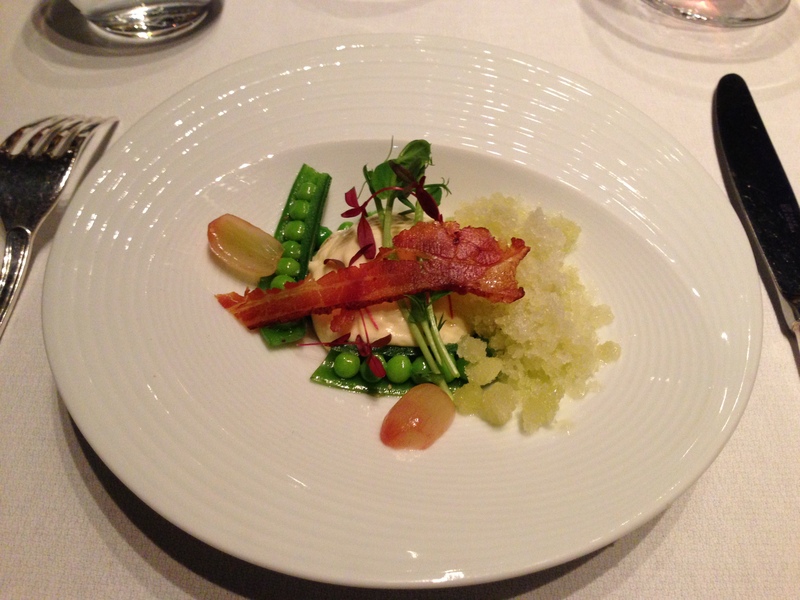 “Parmesan custard, green peas, macerated grapes, wasabi and apple granita” = palate cleanser to get us in the mood for the meat dishes. I’d describe this as cold, cleansing and sour-ish, with pops of peas. 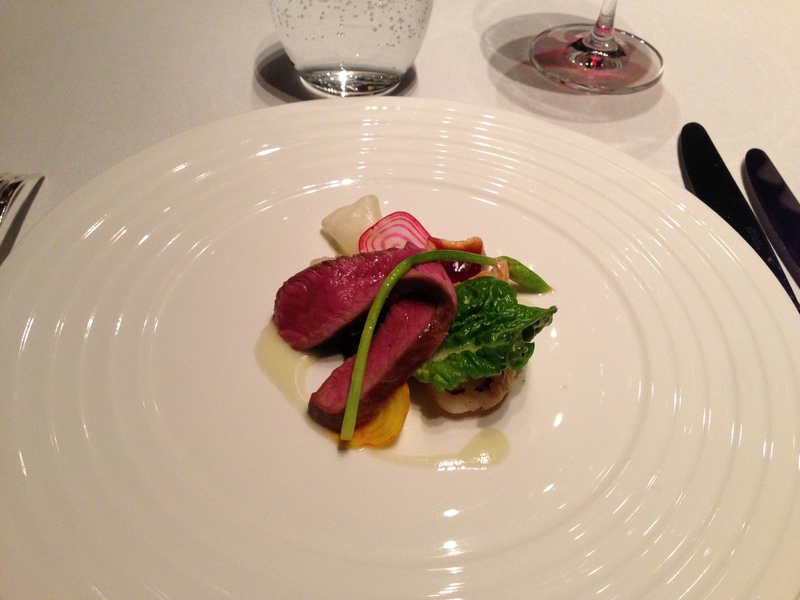 The “salad of Flinders Island lamb, smoked eucalyptus scallop, scampi, masterstock jelly” was a nice little dish that showcased the lamb whilst incorporating lightly cooked seafood. 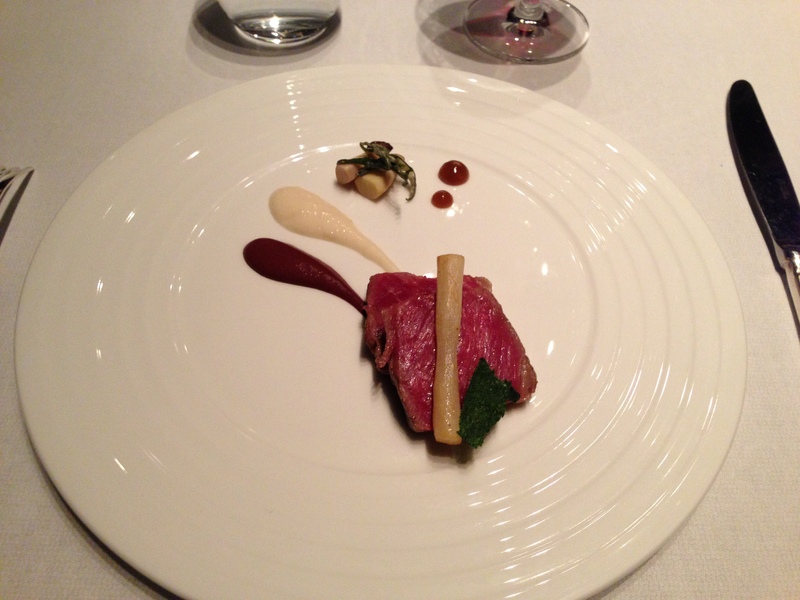 The “Sher wagyu a la plancha, burnt onion and coffee” was delicious. A perfectly cooked piece of beef, however, I wish it came with more sauce and a few more things to accompany it! Dessert number one was “Camargue organic red rice, champagne, Yarra Valley berries” which had nice textures in the semi crispy rice and cold berries and sorbet on top. 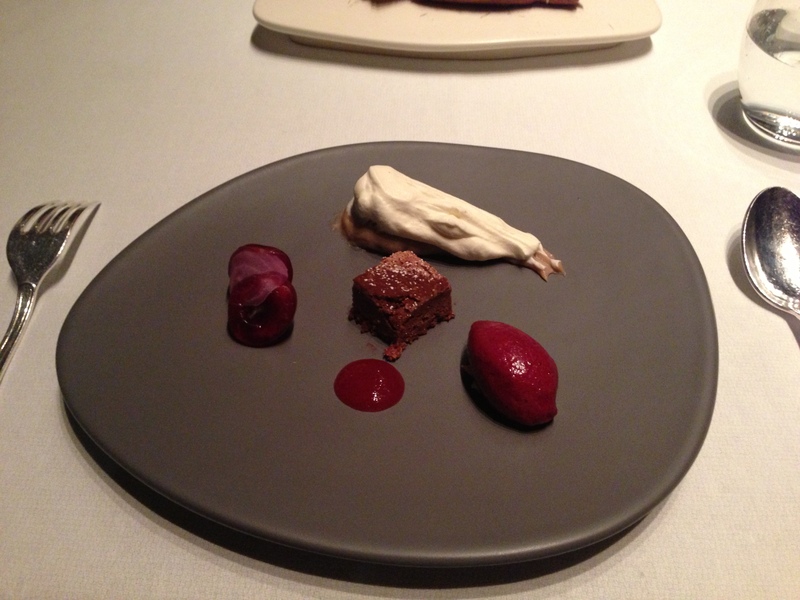 Dessert number two, the “spiced cherries, chocolate and chestnut mont blanc, bay leaf and cassis” was fabulous. Little things on a plate that went perfectly together, and was not too sweet for me. 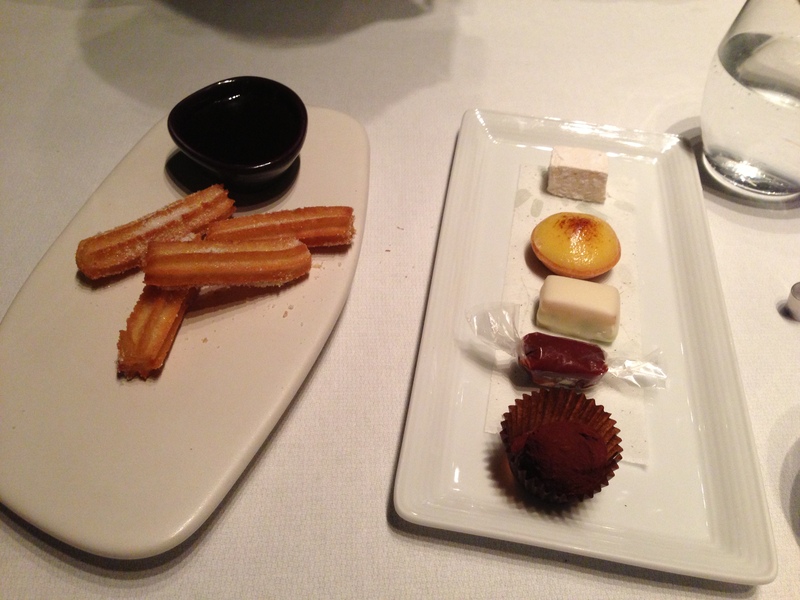 Finished off with the generous petit fours, including Spanish donuts! 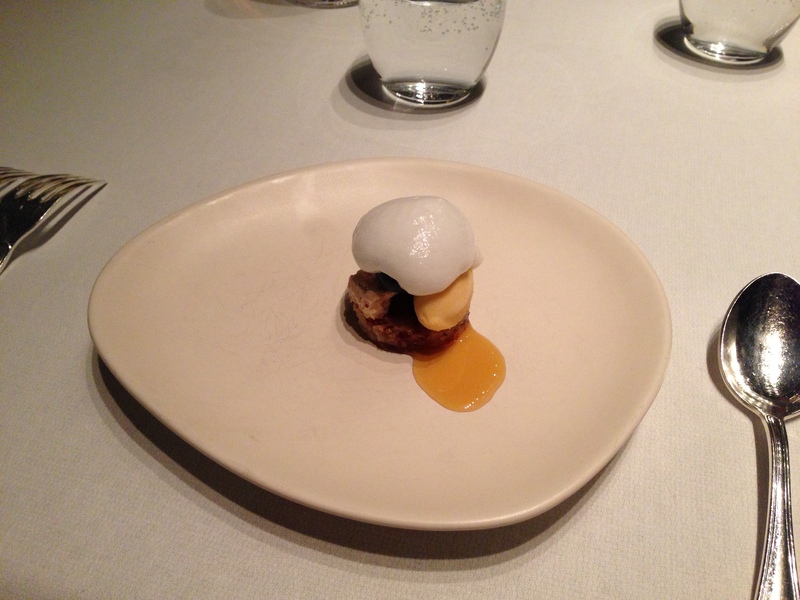 Overall, the dinner was good, but there were a few things that I thought were a bit a miss. The biggest one being when we decided to order the degustation (which is in the $200 per person mark), we were asked if we would like to include truffle with the beef course at an extra $50 per person! I don’t know what was worse… trying to be up-sold truffles or that it was $50 per person! 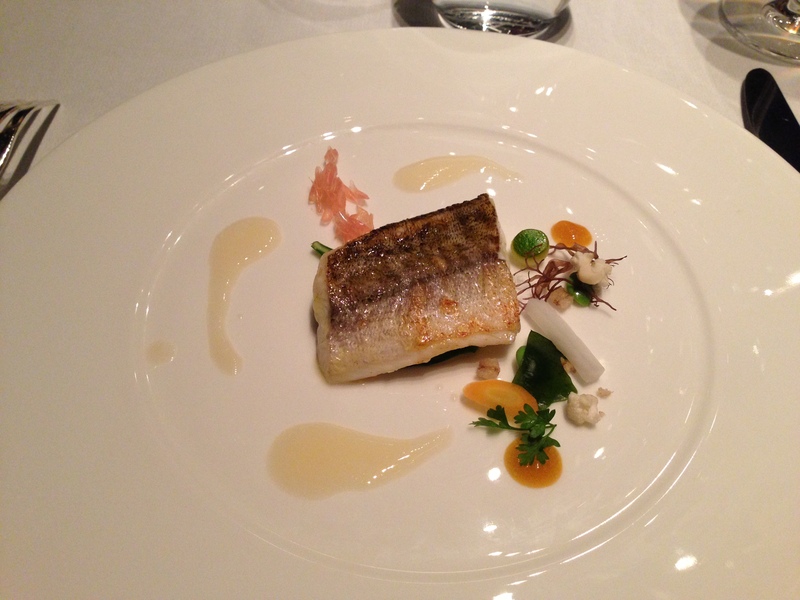 The food was well presented and immaculately prepared, service was good and atmosphere was a bit stiff. Would I revisit? Probably not for another 5 years. Would I recommend you go? Nope, there’s more exciting dining for more reasonable prices in Melbourne.